We have all experienced that sinking feeling that somehow, someone else just took control of our lives and that we are powerless to do anything about it. Maybe, we just accepted a heap of lies from a politician, we bought something we didn’t really want, we agreed to do something we really didn’t want to do, or we lost an argument because we let our words be twisted against us. We feel helpless because we don’t know what is really happening to us and we seem to have no way of finding out. It might be the government, your boss, a politician, a colleague at work, a family member or an advertising campaign. Manipulation as a means of controlling or influencing human behaviour is now a constant at all levels of modern life – it is everywhere.We all know that sometimes we are being manipulated by someone. Mostly we do nothing about it because we can’t or we just don’t know how. Occasionally, when we get so frustrated that we just have to act, we often end up in a costly mess, regretting that we ever challenged the manipulator in the first place. Most of us are as innocent as lambs to the slaughter when it comes to the professional manipulator. But there are ways to understand and manage a manipulator, whether it’s an individual, a group, or a government. Firstly, we need to be able to recognise and understand a manipulative act, how it works, the motives for it and why we, in particular, are its victims. To this end, the author seeks to illuminate “Human Manipulation” at all levels. 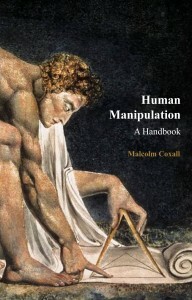 This handbook provides the reader with a detailed definition of human manipulation, an understanding of the history and morality of manipulation, and the psychology of the manipulative and manipulated personalities. Then, one by one, the book identifies and examines each of the 450 manipulative techniques that are described in detail, how they are executed and what a victim can do to recognise, avoid and counteract them. Manipulation is generally covert and it relies on human ignorance. We rarely recognise a manipulative action at once and if we ever finally discover it, it may be just too late to take action to avoid it. However, the better informed we are on the subject, the better our chances of seeing and managing manipulation when it is directed at us. This handbook is probably the most comprehensive analysis of human manipulation anywhere and a “must have” for any serious student of the subject. In government and business, political manipulation is constantly used for institutional social control. It is now the preferred method, in fact. This is simply because our leaders can no longer use the more traditional acts of violence and intimidation against us. Thus, a new, efficient modus of control has evolved to herd and manage the human population. It is omni-present. In fact, we are so inured to manipulation, that we even do it ourselves: at home and at work with our colleagues, friends and family. More frighteningly, as the lines between government and commerce become blurred, government and big capital merge, from a popular point of view, into the great “Them”. “They” are now in a unique historical position. “They” have access to unlimited economic resources, “they” control the media, and “they” control all political and military resources and institutions. A concentration of power between political and economic elites creates an enormous risk to human freedom. These elites have moved on from the messy and violent traditional methods of social control, to a much more dangerous paradigm of social manipulation: but this time backed up by the end-stop of limitless state and political violence. Such a dangerous conjunction of total influence and power has rarely existed in human history. This is a time for universal political reflection and the primary reason for this book. Forewarned is forearmed.